Hello from Sarah and Stu! 6,924 images & 282,278 words in 314 blog posts! 78,328 miles / 126,057 km travelled across 28 countries! We love to travel, particularly in motorhomes. A motorhome gives you the freedom to explore at your own pace without having to carry a 25kg rucksack from place to place. Even better, when wild camping you can save quite a lot of money that can be better spent elsewhere, wine, food and sightseeing - even helicopter rides! We have motorhomed around Australia & New Zealand, United States and Europe in various different vehicles and have enjoyed every minute of it. We have been pretty good at keeping atravel diary, in some cases an entry every day for 6 months! Keeping a diary has helped us keep in touch with friends and family whilst on the road and helps us remember what we did. We kept track of our Europe costs as a resource for other travellers. We can be reached via mail@toureuropebymotorhome.com. 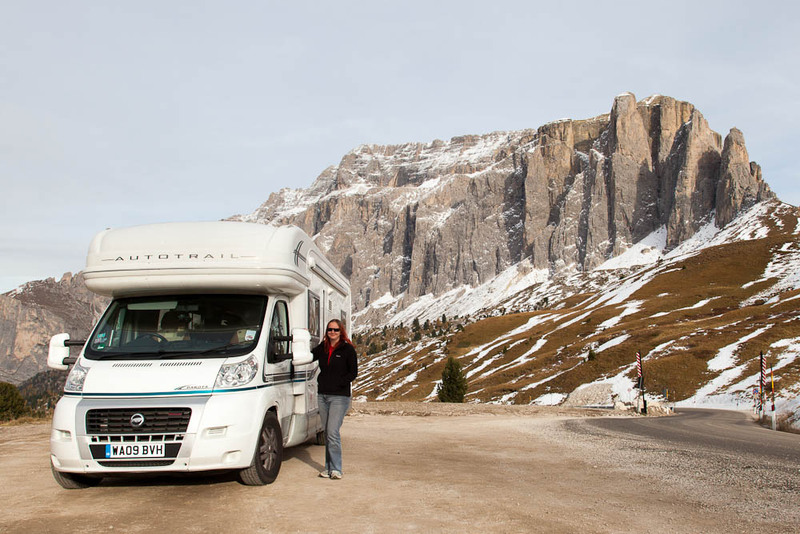 Sarah with our home in the Dolomites, Italy. Our final goodbye to the northern hemisphere before emigrating to Australia. We intend to motorhome around the majority of Western Europe in our new motorhome. 28/04/14 Salut Switzerland, Country 20! 27/03/14 You Don't Like Coke? 08/10/13 Not Gross At All! 25/09/13 When Hungary, you're nothing Budapest! 20/09/13 It Means Nothing To Me... Oh... Vienna! 05/09/13 Are The Stasi Reading Our Blog? Not all of our world tour was by motorhome. Some of the destinations would have been very difficult to navigate in a motorhome; not impossible, but not for us. We were happy to travel Asia by a combination of flying and overnight trains. 11/02/11 We're surrounded by liquid hot magma! 15/12/10 One Minute To Get Off The Train! 14/12/10 At Least We Have Lunch To Look Forward To! 12/12/10 "Hey You, Come Into My Shop!" 21/11/10 Happy Birthday To Me! 12/11/10 Big And Bronze Buddha! 02/11/10 Buddha Bing, Buddha Boom! Our first venture into motorhoming was quite an undertaking. We circumnavigated around the whole of Australia and the majority of New Zealand. 20/03/09 Did Someone Have Eggs For Breakfast? 08/03/09 Would You Like Ice With That? 07/03/09 Haasta La Vista, Baby! 05/03/09 A Nice Place To Live? 03/03/09 Welcome To Middle Earth! 28/02/09 Albatross! Come And Get Your Albatross! 12/02/09 Complete And Utter Bollards! 03/02/09 Could You Get Any Closer To Our Van? 31/01/09 Attack Of The Whirly Winds! 16/01/09 Six Hundred Metres? No Problem! 15/01/09 Where Are The Monkeys? 10/01/09 We Thought The Northern Territory Was Hot! 18/12/08 A New Radiator... In This Weather? 09/12/08 Dingos Took My Baby! 03/12/08 No Jokes About Big Bananas, Please. 30/11/08 Hmm... I'm not sure... can you pour another? 29/11/08 One down, Eighty-nine to go! Our working holiday in Sydney, getting ready for our Antipodean adventure. 02/04/08 Great Whites, Great Waves, Great Rides!